The right tool, at the right price. Every time. Extreme Torque 1919 Stubby Combination Wrench Set (Metric) features drop-forged, heat-treated carbon steel that is chrome-plated, and buffed to a mirror finish. With precision-machined 15-degree open and 12-point box ends, their compact size allows for work in tight areas that conventional wrenches cannot reach. 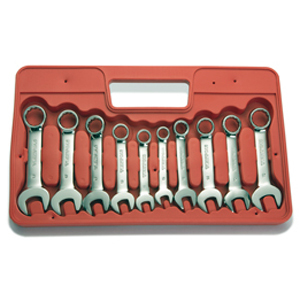 Extreme Torque wrenches have a lifetime warranty and replacements are available individually. About Us >Find Us >Like Us!